After seven years, the IEA Solar Heating and Cooling Programme (IEA SHC) is planning to launch another international research cooperation on PVT technology. PVT includes panels which combine photovoltaics and solar thermal into one unit either as glazed or unglazed systems. The first and only task on PVT systems was completed in June 2010. The new one, entitled Application of PVT Collectors and New Solutions with PVT Systems, is in the definition phase. It is expected to start in July 2017 and run for 3.5 years. Interested researchers and industry representatives have been invited to attend a two-day workshop at ETH university in Zurich, Switzerland, from 16 March (1 p.m.) to 17 March (12 a.m.) in order to discuss crucial aspects and the structure of the global initiative. “The key issue is how to design optimised and reliable PVT systems,” explained Jean-Christoph Hadorn, member of the IEA SHC Executive Committee (ExCo) (link to http://www.solarthermalworld.org/content/iea-shc-reaching-40-years-global-research-activities) and manager of Swiss firm Base Consultants. 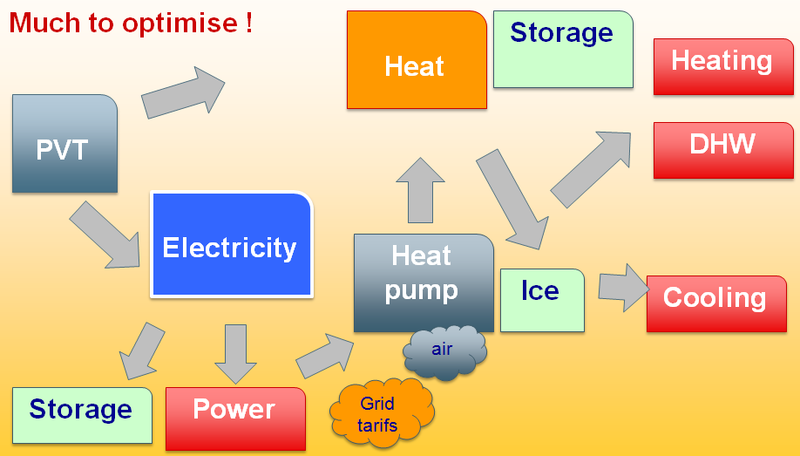 Hadorn, who proposed the new task, created the chart above to illustrate the multiple energy flows between PVT and consumer demand. He intends to focus on systems and their applications, which means no research of components, but simulations to approve the optimised yields of certain configurations. The engineer emphasised that there had been significant changes in market conditions since the end of PVT Task 35. Photovoltaic prices had dropped considerably and a lot of new PVT products had entered the market. But the most important thing had been the establishment of a supply chain. After several years of a highly fluctuating market with PVT suppliers coming and going, it was now in the hands of rather committed manufacturers and suppliers of approved PVT modules. PVT systems harbour great potential for a variety of uses. The photo shows the PVT facade on a building of the Concordia University in Montreal, Canada. The ExCo approved Hadorn, the committee's deputy country representative for Switzerland, as operating agent of the new task. The consultant will coordinate the research activities in close cooperation with the Swiss-based SPF – Institute for Solar Technology. This is a new model within the IEA SHC Programme, which usually has researchers as operating agents to manage the tasks. “I think this model is very efficient because heading a task is more of a management duty, whereas scientists would like to focus on research activities,” explained Hadorn. The Swiss consultant with 37 years’ experience in the renewable energy industry joined the IEA SHC Programme for Task 7, 26, 32 and 44. This is a new model within the SHC Programme, where usually researchers are managing the tasks as operating agents.